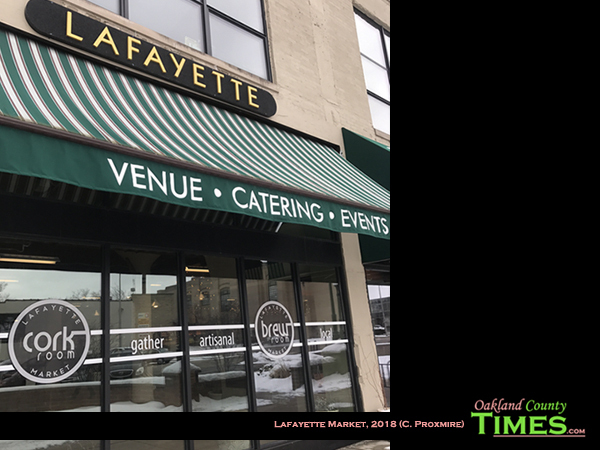 Pontiac, MI – Lunch at the Lafayette Market was a wonderful experience. The market has a nice open feel with plenty of tables and people to run into. I was there last week to meet with the Director of the Pontiac Regional Chamber Damany Head. I also chatted with Chris Jackson who is running for State Representative, Lucetry B. Dalton who is a Clinical Psychology Fellow at McLaren. Both are members of L. Brooks Patterson’s 40 Under 40 program for 2018. And there was a table of people from All Saint’s Church. There were other people having meetings, reading, eating and using laptops in the cozy office away from the office kind of environment. There were many good sandwich options, but I picked mine based on the name – The Woodward Melt. 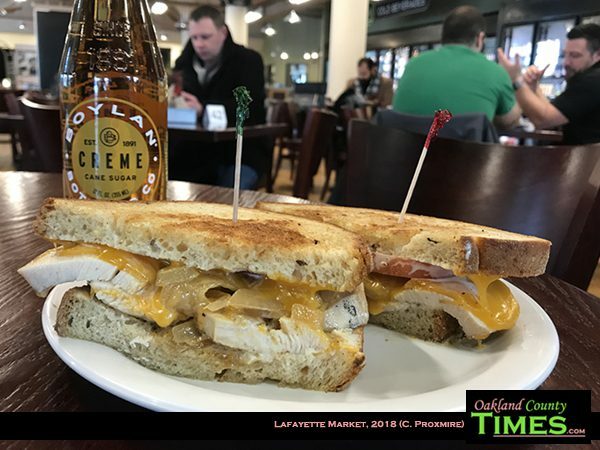 This creative concoction had grilled chicken topped with melted cheddar, caramelized onions, tomatoes and ranch dressing on 9-grain bread. The Market is full of beverage options, including fancy beers, teas and kombucha. I opted for a bottle of Boylan Bottling Company Crème Soda, which also comes in other flavors. Other sandwich options include the Chicken Sanibel, the Lafayette, the Gladator, the Chevy, the County Chick, The Cure and more. Explore them online at https://www.thelafayettemarket.com or in person at 154 N. Saginaw, Pontiac, MI 48342.